A recent case in which a ten-year-old boy hanged himself served as a terrible reminder of how domestic violence in the home can have devastating consequences on children. At first it was just a rumour and I was unable to confirm if it was true. But the next morning the story was in the local newspapers and I was shocked to learn that it had taken place less than a kilometre from my house. That day, after I had finished a field visit related to another case, I went to the locality, along with a colleague, to see if we could find out more. The family was busy with the boy’s funeral but we were able to talk to neighbours. According to one of them, the boy was the only son among four siblings. His father, a carpenter, spent all his earnings on alcohol. His mother worked as a domestic help in a few households in the neighbourhood to make ends meet. There were frequent quarrels in the house, as the boy’s father would berate and beat up his wife and children after coming home drunk. After one such violent incident, his mother had returned to her parental house along with the four children. It appeared that the boy had later returned to his family house on his own and committed suicide by hanging himself with a loin cloth. I was very disturbed. As a gender volunteer, I have come across many cases of gender and domestic violence. We try to help the women and we also help their children as much as we can. But we can only act if the mother expresses the need for our help. Sometimes, we act on our own if we notice that intervention for the children is crucial. We are aware that the impact of domestic violence on the emotional, developmental and physical well-being of children requires close attention and we try to include intervention work for children as much as we can. However, we don’t have a project yet that works specifically with children living in homes where domestic violence is present. In 2007, as part of one of our awareness drives on violence against women, we organised a painting competition for children aged nine to 12 years old. 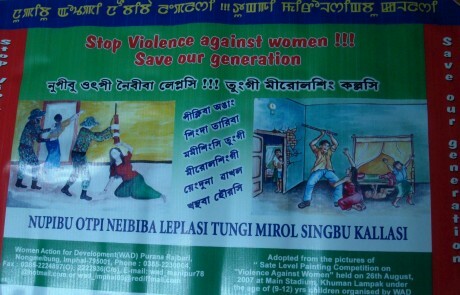 One of the paintings showed how domestic violence is seen through the eyes of children. We use this painting in our posters to highlight awareness of gender violence and its impact on women and children. Sometimes it takes a child’s eye to draw our attention to crucial details that we have overlooked.